How do I display the 3dcart SSL Secure Store seal? How do I make modifications to my site if I don't know HTML? How do I Create a Custom Landing Page? How is the "Close Store" feature used? How Do I Add A Manufacturer Logo to the Product Listing Page? How do I access my site's CSS file? How do I use the Online Store Manager's Quick Design Bar? What "Order By" Options can I use? Can I add an Age Verification Pop Up to my Store? How do I use WYSIWYG? How do I show my Products in the "Browse by Price" section? Is there an EASY way for me to create my own custom form? Where can I upload additional versions of my Frame? What are the available Email Template Variables? What Email Template Variables are there for Gift Registry Emails? Why can't customers leave a product review using an iPhone? How do I use the Core Theme Editor? 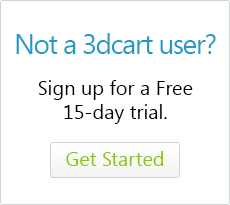 How Do I Add Google Address Autofill to my 3dcart Store?